View Our Calendar, Check Results, Map Your Route Sign Up For One Of Our Below Featured Events Or Browse Our Classifieds Pages. Add Your Event Or Results Today. There Are No Fees For Listing Your Event. Free Online Registration For Running Races, Walking and Jogging Events. Sign Your Event Up For On-Line Registration. It's Quick And Easy. View Running Race Calendar List 2017 Events View Race Results Visit Our Popular Online Classifieds. 5th Edition Now Available! The 4 Year Running Planner! I have found that I can stay motivated when I have records to view my personal progress. I can use this information for planning and reaching my future goals. This training log contains all you will need to log and monitor your daily, weekly, monthly and yearly progress. 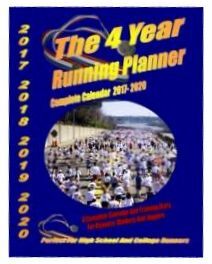 Included in this runner's log are daily charts with calendars, monthly calendars, yearly calendars with graphs, personal records, race results and pace charts. You will also find that there is plenty of extra space for notes, pictures, newspaper clippings and more. Map Your Run Measure your Running or Walking Route. View Our Homes For Sale By Owner Classified Pages, to List or View Homes in Your Area. View Our Cars For Sale By Owner Classified Pages, To List Or View Vehicles For Sale In Your Area. Wholesale! Tri Color Glow Necklaces! for fundraisers, festivals and evening events! Classifieds Online classifieds, boats, cars, homes and more. View some of our more popular classifieds and event calendars including cars, homes, festivals and car shows.